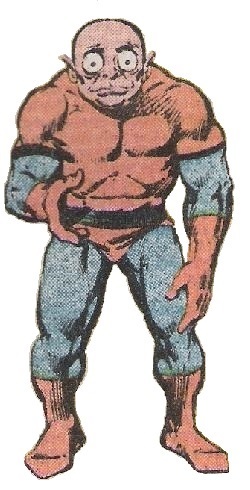 Powers/Abilities: Peeper can see miles beyond the average human, and can emit destructive energy from his eyes. History: Little is known about the background of Peter Quinn. (Captain America Annual#4 (fb)) - Quinn was recruited, alongside four other mutant men (Burner, Lifter, Shocker, Slither), to serve in Magneto’s new Brotherhood of Evil Mutants. (Captain America Annual#4) - Wanting to exploit a tiny spaceship he had found, Magneto sent the Brotherhood to apprehend the diminutive Mister One, who controlled the large Mister Two. Peeper spied Captain America take One and Two to a SHIELD facility. The villains attacked One and Two, and Captain America, in a park. When SHIELD arrived, the Brotherhood fled back to headquarters, and Magneto captured Mister One. The Brotherhood was shocked to learn the plot involved the tiny spaceship. Quinn spied Captain America and Mister Two approaching in a SHIELD ship, and warned the others. During the massive battle, Quinn warned Burner of an attack by Captain America to no avail. Quinn fired optic blasts at Captain America several times, but the shots were blocked with his shield. Captain America tossed Peeper down a trash chute. When Mister One exploded the tiny spaceship, the villains were forced to flee. (Defenders I#78) - The five mutants, abandoned by Magneto, were hired by the Mandrill and given the team name of the Mutant Force, a name they kept in the following years. They attacked a Coloradan Air-Force base with an army of female warriors (under the control of the Mandrill). During the attack, the Defenders (Hellcat, Valkyrie, Wasp, Yellowjacket) intervened. Quinn had seen them approaching and warned the others. Quinn directed the team during the battle, watching everything. When things got out of hand, Quinn, Burner, and Lifter were able to escape with a pile of gold and an unconscious Yellowjacket, leaving Shocker and Slither behind. (Defenders I#79) - The three villains battled the Defenders alongside the women warriors again and rescued their teammates. During the battle, Quinn captured her in a jar and sealed it tight. After capturing Valkyrie, Hellcat, and the Wasp, they returned to the base, where Mandrill put the women under his control and put Valkyrie in charge of the Mutant Force. Quinn taunted Yellowjacket with news of his wife’s capture. The mutants caroused with the controlled women, and Quinn got fed grapes by one. After the Wasp escaped, the Mandrill ordered his forces to attack the Air Force again. (Defenders I#80) - In their battle with the army, Quinn monitored the battle and made frequent reports to the Mandrill. All the surviving soldiers were rounded up in one building and held under an electrical field created by the Shocker. Nighthawk attacked, and Calley and Shocker tried to stop him, but soon the field was shorted out and the Mutant Force was quickly defeated. (Defenders I#83) - The Mutant Force, still in custody, was brought before a special United States Intelligence Services branch. They agreed to become special government operatives in exchange for full presidential pardons. (Defenders I#87 (fb)) - After the Hulk invaded a baseball stadium, the Mutant Force was sent in with the army to stop him, and the stadium was evacuated. During the battle, Quinn monitored the team’s actions. Valkyrie and Hellcat attacked, and Valkyrie repelled Calley’s flames with her sword. When Valkyrie knocked a structure down on the mutants, the Hulk escaped. (Defenders I#87) - The Mutant Force was called to testify against the Defenders in what they thought was a government inquisition (but was actually the alien Tribunal). Lifter testified about their recent battle with the Defenders. (Captain America I#426 (fb)) – The Red Skull offered to finance the Mutant Force members to form a pro-mutant terrorist group. The team (minus Slither) reoutfitted as the Resistants, and changed their codenames. Quinn changed his to Occult. (Captain America I#343) - Quinn (as Occult), Burner (as Crucible), Lifter (as Meteorite), and Shocker (as Paralyzer), in their new Resistant costumes, flew on a rock toward a helicopter where Quill, a mutant, had been captured by Captain America (John Walker) and Battlestar. Quinn blasted Captain America's thrown shield aside, then fired at Battlestar. Quinn then blew the propeller off the helicopter The team rescued Quill; their purpose was a public statement against the Mutant Registration Act. (Captain America I#346) - A Resistant mission, this time with more members (including Quill, Mist Mistress, and Think-Tank), moved to rescue Quicksilver before realizing it was a trap set by Freedom Force. As the two teams battled, Captain America (Walker) attacked. 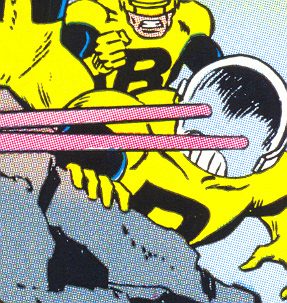 During the battle on a flying rock high in the sky, Quinn fired at Captain America, and received a kick to the head that shattered his helmet. Captain America strangled Quinn and threw him over the side, but Meteorite rescued him. When Captain America threw Quinn over the side again, he landed in some power lines, which electrocuted him severely, leaving him seemingly dead. (Captain America I#426) - Quinn (Occult), with Burner (Crucible) and Lifter (Meteorite), flew in on a flying rock to attack the Mutant Liberation Front, but noticed Captain America and the Night-Flyer (Super-Patriot and the Dead-Ringer in disguise) trying to rob an armored car. They switched their plans and ‘attacked the heroes.’ Quinn and Crucible fired on the heroes, knocking them to the ground. After a short battle, “Captain America” knocked Quinn unconscious. After all three of the Resistants were defeated, Code: Blue arrived and arrested them, who were framed for the armored car robbery. During this mission, Quinn never spoke. (New Warrior II#6) - Back together as the Mutant Force, the villains attacked an armored truck for money. The New Warriors noticed and attacked. During the battle, Quinn appeared to be very frightened, causing Bolt to reach out to him. When Quinn turned on Bolt with a blast, Bolt hit Quinn with an electric blast. All the villains were quickly defeated. (Wolverine II#164) - Quinn, under unknown circumstances, was imprisoned in the superhuman holding facility, the Cage. Now going by the name Peepers, his speech was stunted, and he attributed it to his electrocution years before. When Wolverine and the Beast were imprisoned, Quinn latched himself on to them after introducing himself and eating lunch with them. After a riot, Quinn watched the Beast get stabbed by an unknown assailant. (Wolverine II#165) - Quinn reported to Wolverine (who was in solitary confinement) about what happened to the Beast. Wolverine charged Quinn to protect his friend. In the med-ward, Quinn held off an unnamed assailant with a knife, in order to protect the Beast. The assailant was teasing Quinn, but Quinn escalated into a violent fury and stabbed the man repeatedly until the Beast stopped Quinn. (Weapon X II#26) - Sabretooth got Quinn (out of prison now) a job at Satan's Circus, a hang-out for super-villains. Quinn interrupted a conversation between Sabretooth, Constrictor, and Typhoid Mary, reminding them of the bar's rules, then Sabretooth poured a beer over Quinn's head. (Weapon X II#28) - Quinn waited tables while Sabretooth conferred with Scalphunter. Later, Quinn delivered a note to Creed. (New Thunderbolts#11) - In the House of M reality, Peepers served alongside Sunder as a door guard in a government facility. (Decimation: House of M - the Day After#1) - Peepers, Mammomax and Erg journeyed together to the Xaiver Institute to escape from the anti-mutant members of the Sapien League. (X-Men II#179) - Peepers and Outlaw journeyed to the Xavier Institute together. En route, they encountered the Leper Queen of the Sapien League, but they managed to drive her off and joined the growing numbers of refugees living on the Institute's grounds. (X-Men: The 198 Files - BTS) - Peepers was known to O.N.E. (Office of National Emergency) to be one of the few mutants that retained their powers after M-Day. (X-Men: The 198#1) - Peepers settled into the refugee camp, which came to be called collectively "the 198." He witnessed the arrival of Toad and Lorelei Travis to their ranks. (X-Men: The 198#2) - Peepers witnessed a power demonstration by Mr. M, an extremely powerful mutant who had arrived at the camp. (X-Men: The 198#3) - Peepers allowed himself to be implanted with a tag by the O*N*E so that he could be allowed to leave the camp but remain under their observation. His group's day pass was cancelled when Mammomax threatened a bystander. (X-Men: The 198#4) - Mr. M removed the tags from the 198 and led them away from the Institute grounds. When the X-Men confronted the 198 to try and halt them, they wound up in a fight. (X-Men: The 198#5) - Johnny Dee manipulated several of the 198 into the fight as the O*N*E became involved, and Mr. M was seemingly killed by Magma under Dee's influence. The 198 returned to the Institute camp. (X-Men II#183) - When Apocalypse invaded the Institute grounds to offer mutants an opportunity to serve him, Peepers was among those of the 198 tempted to join his ranks and drink his blood. (Uncanny X-Men#469) - Peepers was hanging around the 198 camp as Cannonball and Husk brought supplies to them. (X-Factor III#26) - While driving near Glenn Falls, New York, Peepers noticed someone following him. He called X-Factor Investigations for help and reached Siryn. Just after he revealed his location, a deer carcass was thrown on his windshield, causing him to crash in teh trees. Wounded in the wreckage, he was quickly overcome by Predator X, who left only his skeleton behind. Siryn later found Peepers' body. (Unbelievable Gwenpool I#13) - Arcade trapped mercenaries in Murderworld, seeing who would survive. Bob: Agent of Hydra, Walrus, and Peeper (apparently alive) avoided the conflict as much as possible. Peeper/Occult/Peepers is one of the strangest ducks in the Marvel Universe. A fairly underdeveloped character, and a Kirby original, he has usually appeared alongside his team as a rather mewling character with fast bouts of bravery. More recently, under Frank Tieri, he became a compelling psychotic with a stunted speech pattern, an angry streak that drives him to murder, and a misleading puppy dog nature about him. I think it says something about Magneto that every early Brotherhood he created had a fawning midget of a mutant that Mags could ridicule: Toad, Amphibious, and Peepers all in a row.